Every day, the self storage industry is becoming more competitive. At the same time, your prospective customers are becoming more selective about the facilities that they build. That’s where Compass comes in. From engineering to design, and from construction to project assistance, we pride ourselves on quality and meeting deadlines. So, no matter what self storage needs you may have, Compass will be there for you to steer you and your business in the right direction to help meet your demands and the demands of your customers. 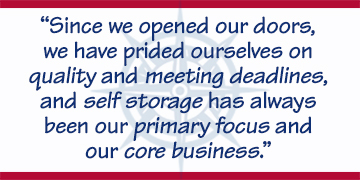 From the first day we opened our doors, we have prided ourselves on quality and meeting deadlines, and self storage has always been our primary focus and our core business. Also, we believe that experience is key, and we have that kind of experienced personnel to back this up—several of our employees have been in the self storage industry for over 35 years. This level of experience makes it possible for us to be highly effective in supplying and erecting self storage buildings on time and on budget. Our commitment to excellence enables us to maintain the shortest lead times in the industry. We feel that just being the best isn’t enough—for that reason, we are continuously working on improving our performance and capabilities.